In 1828 the population of the Village of Greenwich was steadily increasing. Attractive brick homes in the Federal style were quickly appearing on its winding streets to accommodate the new residents. That year two identical homes were constructed at Nos. 61 and 63 Perry Street; each two and a half stories tall with Flemish bond brickwork. A narrow horse walk burrowed between the houses which led to a small building in the rear yard. New Jersey real estate investor James P. Demarest built the homes which would have been sold to financially-stable working families. Demarest added small architectural touches like the wooden enframement of the entrance carved to mimic rusticated stone, the two columns flanking the eight-paneled door, and the delicate iron railings and newels with their cast pineapples—the symbol of hospitality. Throughout the Civil War years and afterward the family of Chardavoyne W. Smith lived in the house. Smith was listed in city directories as a “builder.” Havilah M. Smith followed in the family tradition and for at least two years, in 1879 and 1880, was Chairman of the Finance Committee of the General Society of Mechanics and Tradesmen of the City of New-York. By the turn of the century the little house had become a multi-family building and in 1906 the owner was cited for his failure to provide fire escapes. Robert Johnson was living here around that time. The tenant would find himself in the wrong place at the wrong time a year later. Campbell & Co. was a trucking firm located at No. 436 West 57th Street and the Irish-owned operation employed Italians to drive their carts and Irishmen to drive the trucks. “Recently the Italians discovered that the truck drivers were getting $18 a week while they were getting only $12,” reported The New York Times. The Italian workers requested $15.50 a week and demanded that the Irish workers’ wages be reduced to $15. Management refused the demands and the already-strained relations between the Irish and Italians grew more heated. The foreman of the truck drivers, an Irishman named George McAuliffe, had only one arm. On the morning of January 19, 1907 the Italian cart drivers “pitched upon” him. In the attack Dominick Leddo bit off a piece of McAuliffe’s ear. While the melee was going on, Robert Johnson was innocently passing by the Campbell stable. McAuliffe may have had only one arm, but he had a revolver. “He fired it when he was attacked, but instead of hitting any of the Italians, he hit Robert Johnson,” reported The Times. By now Greenwich Village was becoming the Bohemian section of Manhattan, drawing artists, musicians, writers and poets to its quaint winding streets. In 1904, artist John Sloan and his wife Dolly had moved into No. 61 Perry Street. The artist, whose studio was at No. 35 Sixth Avenue, represented a stark change in American art. 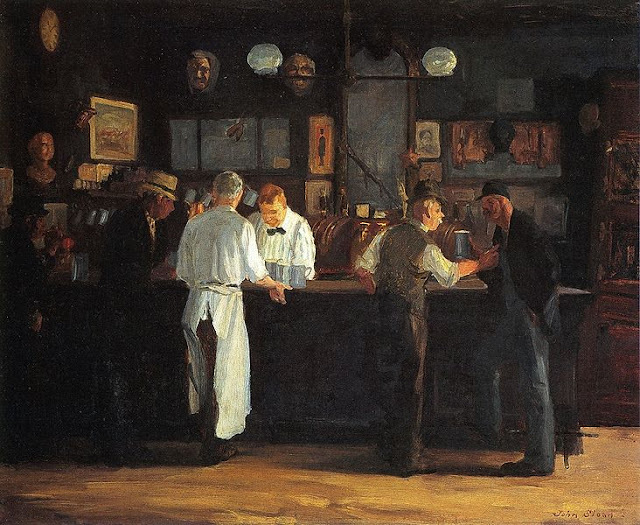 A founder of the Ashcan School, he presented life as it was—often gritty and always realistic. While living here he produced some of his best works—McSorley’s Bar, Wake of the Ferry, and the Sixth Avenue Elevated at Third Street among them. Although he had created dozens of oil paintings, Sloan had not yet established himself as a force in the art world and earned his income by drawing weekly puzzles for The Philadelphia Press and doing illustrations for Collier’s Weekly, Good Housekeeping, Harper’s Weekly, Scribner’s and the Saturday Evening Post. John and Dolly Sloan joined the Socialist Party in 1910 as their disenchantment with the political status quo festered. He became art editor of The Masses and provided stirring anti-capitalist and anti-war drawings to the magazine as well as other socialist periodicals. In February 1913 the Sloans moved to No. 240 West 4th Street in order to be nearer to the studio. Architect Arthur Paul Hess was hired to reconvert the house to a single-family home in 1927. In 1936 sculptor Alice Decker left her husband, political activist and sculptor John Calvin Ferguson. Two years earlier, while still married, she had entered into an affair with the widely-talented and married Lewis Mumford. Although she attempted twice to end the relationship (at her husband’s demand), she was extremely unhappy in her marriage and, instead, ended that. By 1942 she was living in the house at No. 61 Perry Street and turned the little two-story building in the rear into her studio. Using a variety of materials she created modern art sculptures ranging from social comment, like her Scrubwoman carved from wood, to purely artistic forms like sleeping cats. The artistic tradition of the house continued when it became home to poet Lloyd Frankenberg and his wife, artist Loren MacIver. The pair became close friends with poet E. E. Cummings who also lived in the Village in Patchin Place, and poet Robert Lowell. A frequent house guest was poet and short story writer Elizabeth Bishop who would stay extended periods. Bishop was the Poet Laureate of the United States from 1949 to 1950 and a Pulitzer Prize winner for Poetry in 1956. The house, today, is divided into two duplex apartments. The Federal-period interiors have been gutted and modernized; but the exterior retains its 1828 appearance. Through its charming doorway have passed some of America’s most talented artists, poets and writers. Have never read so much history about residential areas, but this blog highlights a very interesting house. Brick-style homes evoke a certain feel into a place. It's homey yet strong. Anyway, thanks for this informative write-up. Great job for this. Tom, thank you for your wonderful curiosity, research, and writing. Your deep dives into a particular location never cease to surprise and engage me. This is one of my favorite NYC architecture/history blogs. About your reference to "newels with their cast pineapples—the symbol of hospitality": I've often seen similar items referred to this way, but I think in many of these cases it's a pine cone, not a pineapple. One clue is the lack of tuft at the top. "[T]he English called the fruit a “pine-apple,” a word heretofore interchangeable with “pine-cone,” because it so resembled the pinecones they knew. The pinecone had strong and ancient ties to Dionysus, the Greek god of wine—-Bacchus to the Romans—-who carried a thyrsus, a staff entwined with grape vines and topped by a pinecone. That association relates to the use of pine resin in wine making. Since classical times, the pinecone has symbolized fertility and regeneration and has been used as a decorative motif. It is the pinecone that the colonists were using in their decorative arts, evoking the classical symbolism that they, educated in the classics, would have understood well." To my untutored eye those newels look more like classical pine cones than pineapples. I think you're right. That's for that. I'll be a bit more discriminating in my pine cones and pineapples going forward! great info.